Meet the California Americana-Country group, CALICO THE BAND! 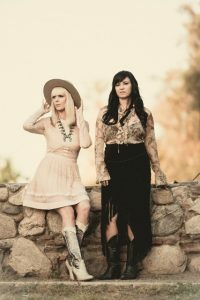 Led by the female duo of Manda Mosher and Kirsten Proffit, they will be releasing their sophomore album “Under Blue Skies” on Friday, September 15. The opening track “Fine Line,” tells the quintessential story of so many aspiring artists that come to L.A. in hopes of realizing their dreams. Everyone in Southern California that makes their way along the miles of freeway knows the “The 405,” the title of Proffit’s only solely-penned album track, on which love blossoms against the backdrop of an all-too-familiar L.A. Another song, like “Roll Away the Stone,” blends the luminous textures of voices over stringed instruments, illuminating the struggle of overcoming addiction through the eyes of one willing to share the burden. I always like to ask artists how their hometown has been an influence on the kind of music they make and really what kind of a band they are today. So how has your hometown influenced you all? Let’s talk about your forthcoming album, “Under Blue Skies” which will be released this September. What was it like making this collection? How do you think that you all have grown since your first album was put out? What has remained the same? What things did you learn and bring to the table for this second collection? Can you elaborate on how singles “Cold, Cold Love” and “The 405” were written for this album? How do you all go about putting a song together? What’s interesting is both of these songs are unusual within the Calico process of writing. Usually either Kirsten or I come up with a song title or verse, chorus, or musical piece…something that has promise and we bring it to each other and complete it out from there. Sometimes we bring in additional co-writers or we finish it just the two of us. For “Cold Cold Love” and “The 405”; these songs existed outside of our collaborative Calico writing sessions, but we felt they were important to put on the new record. “Cold Cold Love” was a song that I brought into the band and has been part of our live sets for a while. We decided to record it for the new record because it brings an outlaw element of musical chaos and gritty energy. I wrote the song years ago with Ian Gothe and Jamie Rounds from Nashville who has since passed. It’s a distraught murder ballad…without the dirge of a ballad. 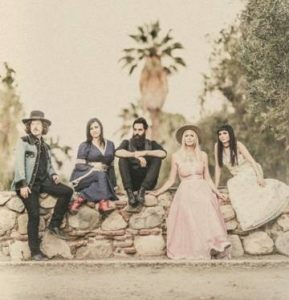 Why did you decide to cover Mamas & The Papas hit song, “California Dreamin’”? Has this always been a favorite song of yours? What are your plans for the rest of this summer? Do you have tour dates lined up?